Hazelnuts add a mellow, toasty crunch to these tender shortcakes. Fill them with fresh raspberries and whipped cream for a heavenly dessert. In work bowl of food processor fitted with steel knife blade, combine flour, granulated sugar, 1/2 cup of the hazelnuts, baking powder, baking soda, and salt. Pulse to combine. Add butter and pulse until mixture resembles coarse meal. In medium bowl, combine sour cream and egg yolk; beat with whisk until smooth. Add sour cream mixture to flour mixture. Process just until dough is moistened. On lightly floured surface, knead dough 6 to 8 times. Roll dough into 12 x 6-inch rectangle. Cut dough into 12 rectangles, each 3 x 2 inches. Place on large baking sheet. In small bowl, beat egg white with fork until frothy; brush over tops of shortcakes. Sprinkle with raw sugar. Bake in 400ºF. oven for 13 to 17 minutes or until lightly browned. Cool on wire racks. Meanwhile, place 1 cup of the raspberries, powdered sugar, and orange juice in blender container. Blend at high speed until smooth. If desired, strain sauce to remove seeds. To assemble, split each shortcake in half crosswise. On individual plates, place I tablespoon raspberry sauce. Place bottom halves of shortcakes on each plate. 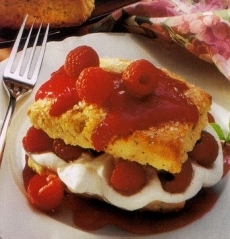 Top with whipped cream, fresh raspberries, and top halves of shortcakes. Drizzle with remaining sauce and raspberries. Sprinkle with remaining hazelnuts.